The Forsaken by Estevan Vega. Publication : March 13th 2012 by StoneHouse Ink. God, it's so hard to keep reviews for a mystery book spoiler-free. I love a good mystery/thriller, especially murder mysteries. They're the ones that keep me up at night, scared out of my wits and yet I'm addicted to that adrenaline rush I get while reading them. As a Criminal Minds and The Mentalist addict, it's not surprising that I find serial killer story-lines the most interesting. This one didn't disappoint! The Forsaken begins with Detective Jude Foster in a mandatory therapy session. He's got a brutal past, one involving his ex-partner that left him scarred for life. Now there's a new killer on the loose and Jude is on this case, forced to work with a new partner while trying to capture him. Only, Jude's not sure if this killer's all that new or if he's someone Jude already has a past with. I've read Vega's YA book, Arson and I loved it immediately because it had a touch of darkness. The same goes for The Forsaken. Vega's one of those few authors who can pull off a completely dark and twisty story while still having some goodness in it. I can't believe I took so long to get to this because it's totally my cup of tea. 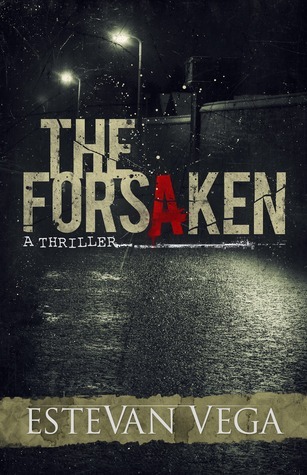 The Forsaken is like going on a roller-coaster ride - thrilling, dark and has you gripped. As usual, the writing's strong and engrossing. The crime scenes were vivid, intense and for a moment, I had to shut my eyes to shake the image off my head. There were a few parts of the book that weren't important..at least not to me. To be honest, Jude wasn't a character I cared much about. I paid attention only to the crime part of the story and that was enough for me. I ignored the flaws because for the most part, The Forsaken was unputdownable. If you scare easily, this one isn't for you. On the other hand, for those who enjoy excellent crime mysteries irrespective of how disturbing it may be, you'll enjoy this one. I don't usually read mystery novels, but this one sounds good. I have been reading so many dystopian books, and I am craving some variety. Thanks for the review!